Last Friday I had the pleasure of talking to Donna Blinston on the NLP View internet radio show about The Meta Model Demystified. 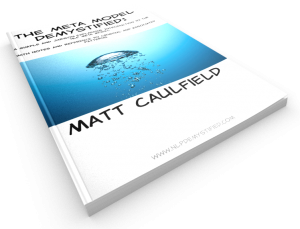 As is always the case, the half an hour disappeared in the blink of an eye and there was so much more to talk about, but I did have the opportunity to discuss the some of the philosophy behind the Meta Model and how I have taken the time effort to explain it in a simple and useable way. You can listen to a replay of the show on YouTube below. You can buy the book, currently available exclusively on Kindle, here. Nested Loops Demystified Out Now NLP VideoBlog Episode 23: Lie To Me?